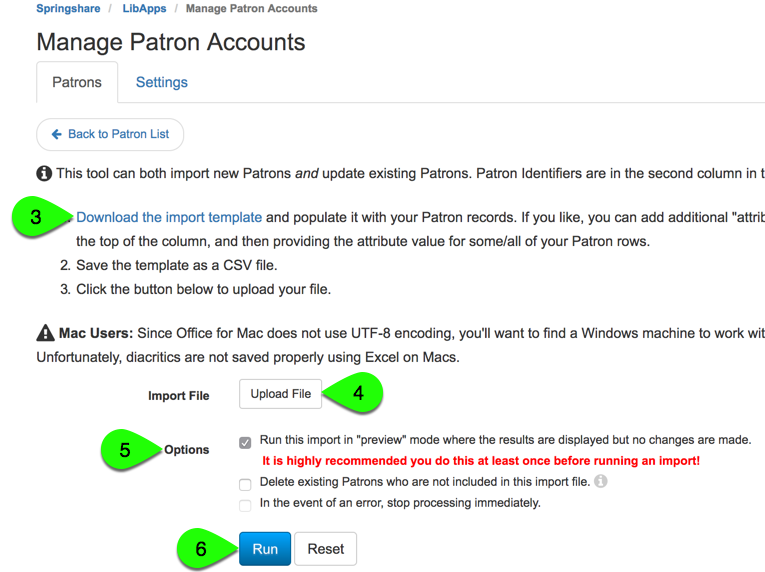 The Manage Patron Accounts page includes an option to import or update your patron accounts in bulk. The tool allows you to quickly import (or update) and activate patron accounts for any number of users at one time. From the LibApps dashboard, click on Admin from the command bar and choose Manage Patron Accounts. Click on the Import Patrons button. On the Import Patrons screen, download and complete the import template file -- saving it as a .csv file. Once you have the template file complete, click the Upload File button and find the .csv file on your computer. Be sure to save your file with UTF-8 / Windows CRLF encoding. If you are a Mac user, please be aware that Excel for Mac does not offer options for saving as CSV with UTF-8 encoding. Please save your data using a Windows computer. Run a preview of the import that will display all of the accounts that will be created or updated without making any changes to the records. It is highly recommended that you run a preview of the import at least once before officially running it. When you're ready to run the import, uncheck this option. Delete existing Patrons who are not included in this import file. Checking this option will delete every patron account that is not included in the file being imported. Stop processing immediately if an error occurs. Note: this option is only available when running the actual import (not the preview).